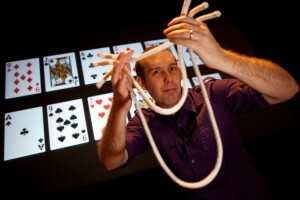 I run my own business called Science Magic Shows. The majority of my work is presenting shows and workshops. I also provide consultancy and training. One of the most enjoyable aspects of my Atomic Physics Ph.D was the science outreach. Both my supervisors were keen to communicate the original research we were doing. I was given the opportunity to participate in the university’s open days and Christmas lectures. The ‘Lab in a Lorry’ and ‘Meet the Scientist’ projects were launched during that time and I got to be one of the first round of trainees. After graduating I spent a year training on a Drama and Theatre in Education course which exposed me to performing shows in schools and theatrical direction skills. In 2007 I started working part time in the Education team at Thinktank Science Museum. My days were spent presenting workshops and shows in the dedicated classrooms and theatre. Ever since I was a kid, my passion has been magic and illusion. 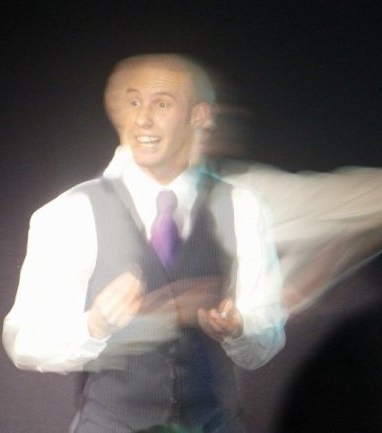 Alongside the above experiences I was using my time off work to perform at parties, weddings, stand up comedy clubs and eventually tour my fringe theatre shows around the UK festivals. It was inevitable that my love of science discovery, magic and communication would crossover. I’m fortunate to be in the position to earn a living and travel the world doing all three in my Science Magic Shows. I love simplifying the complex and communicating it in an original and creative manner. And there is something special in presenting to children. They still have innocence and curiosity that by the time they turn into adults has been beaten out of them. For me inspiring curiosity, wonder and playfulness in my audiences is a major motivation. One of my pet hates is when I attend a science day in a school and the kids have been encouraged to turn up dressed as scientists. You look out over a school hall full of mini ‘mad science’ Einsteins and Big Bang Theory nerds. The teachers tend to actively reinforce this bad stereotype by dressing up in the same. As science communicators we have to fight this idea that scientists are either in the super intelligent elite or the socially inept geek (or both). For me science is a way of thinking not a career and anyone can be a scientist by exploring the amazing world we live in. I love simplifying the complex. I love challenge of engaging an audience in a subject that they might not have originally been interested in. I love the wows. I love the laughs. I love being my own boss. I love that my toy and book purchases are a tax deductible expense. The motivation for turning full time freelancer was a commission from the ss Great Britain trust to write and deliver a KS3 science magic show inspired by Brunel. Working with Rachel, Rhian and the team at the ssGB was a brilliant experience. And I was definitely in awe of the genius of Brunel and the fantastic renovation of the ship down in Bristol. Follow your passions. Feed and invest in your passions (books, videos, site visits, conferences etc.) Grasp every opportunity and gain lots of experience. Put in the work. Reflect on what you do. Learn from mistakes. Pick yourself up when it doesn’t work out. Study other communicators (not just scientists). Be yourself. Attend the BIG event (British Interactive Group). Don’t get your audiences to cheer like pirates.